How can I adapt the oversized-dressing trend without looking sloppy? It may seem counter-intuitive to wear oversized clothes when many people prefer their clothes to fit well. But the oversized dressing trend does have its advantages: It adds bulk to petite frames, disguises parts of your body you may not be confident about and makes a statement. But there is a fine line between being stylish and looking sloppy. So, think along the lines of long, fluid silhouettes, rather than baggy, ill-fitting clothes. • Petite women can get away with wearing an oversized blazer as a dress, but wear tights for extra coverage. If the hemline is too short for your liking, wear it with a mini skirt or dress shorts. • To avoid looking overwhelmed by your outfit, show some skin. For example, if wearing an oversized shirt dress, roll up the sleeves past your elbows and pair it with strappy sandals or heels. If you are not confident about your legs, a cropped oversized pair of pants that show off a bit of the ankle is just as effective. • Play with proportions: go bag-lady chic and pair an oversized cardigan with a maxi skirt. Wear a belt to add some definition. • As a rule of thumb, if your top is oversized, make sure your bottom silhouette is streamlined and vice versa. This will balance your silhouette. 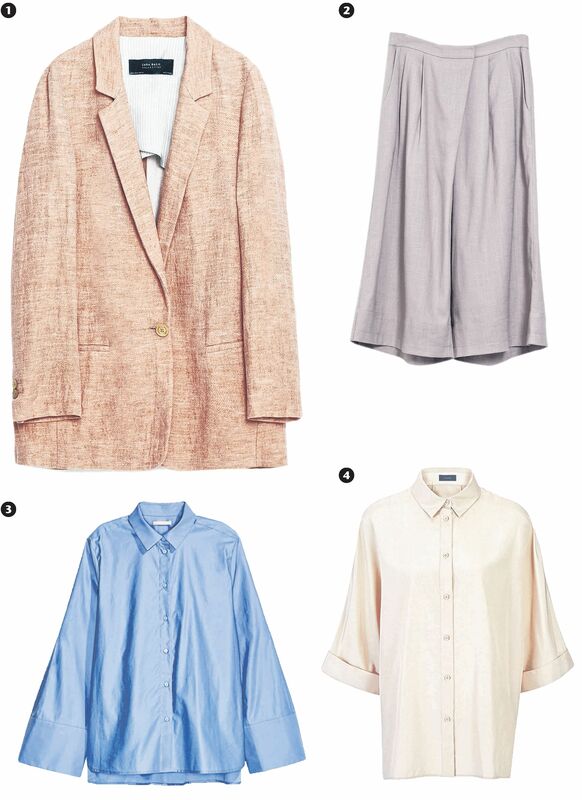 The oversized blazer is the easiest way to ease into the oversized dressing trend. If wearing with oversized trousers, make sure it is a high-waisted pair so your legs will look long, not stumpy. As these culottes will show a bit of the ankle, you can get away with pairing it with an oversized shirt. Try tucking in only one side of the shirt into the waistband. The exaggerated sleeves are a statement. Wear with a slim-fitting bottom and big earrings. The cropped sleeves show off the slimmest part of the arms, the forearms, and the tapered fit of the blouse means that it will go well with either skinny pants or a pencil skirt.